I’m starting to think that I don’t like Tracy Mcgrady very much. I know some people on FESPN think he’s cute. My girlfriend thinks he’s cute, cuz he always knows where the camera is. 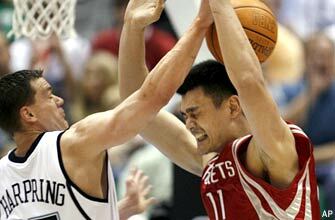 If you’ve watched the Jazz/Rockets series you know Mcgrady and Yao are more talented than anyone on the Jazz roster. You’ve probably also figured out by now that the Jazz are the better team. It’s not just because he’s always smiling and winking at the camera; Mcgrady doesn’t play with guts. He’s not out there dying for it, like A.I., or Harpring, or Baron Davis (who beat top-form Nowitski on Sunday). I think Mcgrady needs a signature dunk. but that’s what makes lazy-eye so great. he just glides along seemingly uninterested and then he murders you. even his drives are like that: dribble, dribble, nothing’s going on then he’s pulling some reverse lay-up you thought was impossible. it’s true. He pulls off some crazy shiz with perfect nonchalance. I bet you the Rockets owners and some fans wish he’d add a little spirit though. i like that he usually prefers to lay it up instead of dunk it.